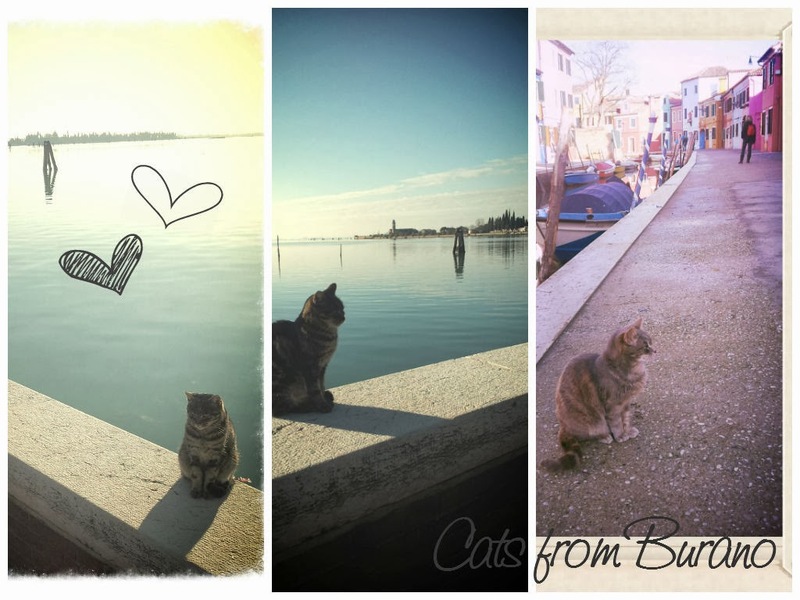 Burano is one of islands of the archipelago around Venice and it's a lovely and cosy stop I totally recommend if you are visiting the city. 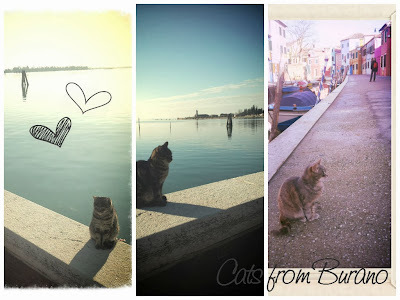 Most of people usually add to the visit also a stop to the neighbour islands of Murano and Torcello (which is lovely as well), but in my opinion Burano is the prettiest and most particular. The most common way to reach it is to take a vaporetto (= ferry) from the Fondamenta Nuove pier in Venice. You can reach them by using a daily transport ticket for common commuting in Venice (which anyway is pretty much expensive - 18 € during my last visit there in December 2013 - but that's the way it is). It takes about 50', and if the day is sunny, it's a nice sail through the lagoon. 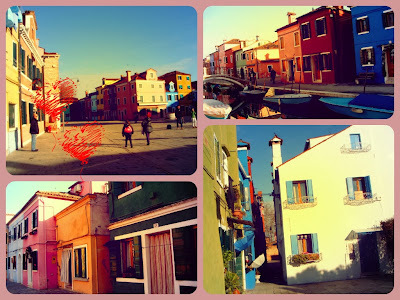 The charachteristic of Burano that mostly catches the eye are its very colourful tiny houses. 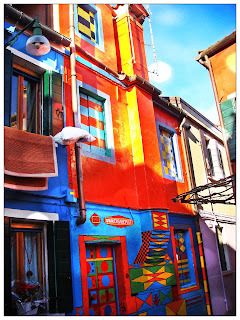 Each house is completely painted of one bright colour and they transform the island in a lively and pretty patchwork. No one knows exaclty why Burano people got this tradition with painting their houses: some say it's because sailors could recognize their home when sailing back through the fog, others say each colour represents a family; but alas, even if we don't know where the tradition comes from, I'm glad they've kept it, because it's such an eye candy. Just hang around the alleys and admire every single house: the atmosphere feels so friendly and laid back and if you are lucky you might also meet some cat wandering and enjoying the sun. The most famous house in Burano is Casa Bepi, residence of the local artist Giuseppe Toselli. He passed away in 1992, but the house, where nowadays his sister lives, has been kept the way he had decorated it. Bepi was a self-taught artist who loved painting and cinema, and everyday he was adding some little changes on the front part of his house, which contains the colours of all the houses in Burano. But Burano is actually famous for the handmade production of merletti (=laces). There's a museum and also a school, which preserves the survival of the tradition. There are many shops on the island where you can buy laces and in some of them you will also find some of the lace artists giving you a practical demonstration. The traditional manner to needle it is quite a hard job and it's fascinating to be watched. Most of these shops are located around the main (and basically only) square of the island, which is dedicated to Baldassarre Galuppi, an 18th century composer who was born here. I can recommend this place, but I also suggest to book with a bit of advance, because when we went there to ask the first available table was at 2.30 pm. But it's been worth the waiting because the shrimps + pecorino cheese tagliatelle we had were delicious. I've also tasted the typical Burano biscuits, shaped as an "S" and yellow. They served them with a glass of sweet wine and it's been enjoyable as well. Yeah, it's somehow less famous than other places in Venice but it's actually one of my fave spots, also because it's much more quiet and less crowded than the city. It's a colourful small corner of paradise!